Primarily a physio by training, I am now furthering my clinical skills by undertaking an MSc in Advanced Practice. Although not a new role, Advanced Clinical Practitioners (ACPs) are undergoing significant restructure to ensure nationwide standards are not only high, but consistently high regardless of primary training (nurse, physio, pharmacist, paramedic, dietician etc). 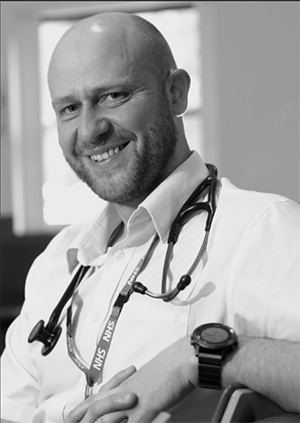 It is a very exciting role that I believe can revolutionise healthcare as we know it by allowing very skilled clinicians greater training and autonomy to help patients. I also live and work with persistent pain, fatigue, and cluster headaches. I’m an advocate of self-determined management of chronic conditions and the fundamental principle that we all have a responsibility to do our best to maintain our own health and fitness. For leisure, I read (usually classic literature), listen to music, and run marathons for charity – this year is Macmillan and Treetops Hospice. I am an ex-army medic and live in Derbyshire with my small family, ponies and peacocks.